Grammarly is the online platform for spelling and grammar check for free. Grammarly helps you to write English with much confidence. After writing a document or an email, you'd need to proof-read it before sending the file to anyone. For grammar check, you should try the Grammarly app. It is available to download for MS Office, Windows, Google Chrome and Android. This app is useful for students, office goers, and writers. 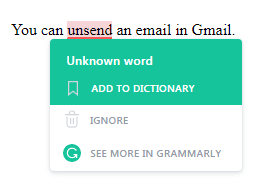 If you type unique words, it may show as misspelled words in Grammarly. You can add those words to your personal dictionary. So, when you type the same words for the next time, it won't be flagged as misspelled words. As of now, Grammarly supports only the English language. You can set your native English as Canadian, American, British and Australian. Except for English, even symbols won't be added to the personal dictionary. Besides, multiple English words separated by commas or space also can't be added. 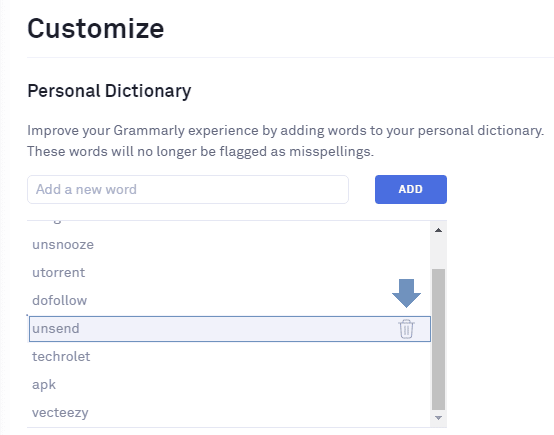 In this post, you'll learn how to add and delete words from Grammarly personal dictionary. Grammarly account. (Sign up for Grammarly free account). 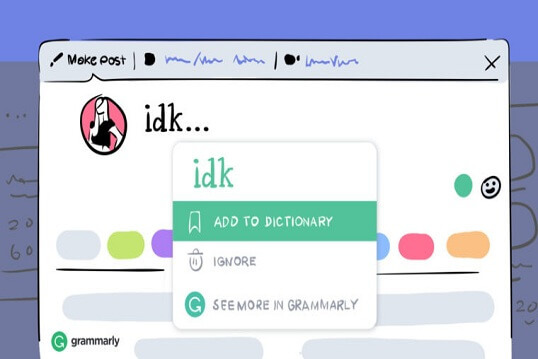 Grammarly Add on. (Click here to download from Chrome Web Store). 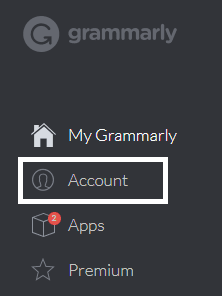 Login to your Grammarly account through the Google Chrome extension. Open any online document or input field to type the message. You will see the Grammarly icon inside the text input field. If you type a unique word, it will be underlined or flagged in red. Hover the mouse cursor over the underlined word. You will notice a card for the highlighted word showing suggestions and an option to add the particular word to your personal dictionary. If it doesn't show any suggested words, it will show as an unknown word. Click on Add To Dictionary button. Whenever you type the same word in future, it will not be highlighted. You could use the same procedure to add unlimited words as possible. Look for the Account icon at the top left side. Under Customize, the first category will be your personal dictionary. Search for the words you want to remove. Hover the cursor on the word, you'll see a Trash icon at the right side. The incorrect word will be deleted from your personal dictionary. While writing a document, if you don't want to add a word to your personal dictionary, you can tap on the Ignore button. From my experience, Grammarly is the best grammar checker app to proof-read your document. Ginger software, WritingHelp, and SlickWrite are the alternatives to Grammarly tool. Liked this tutorial? Don't forget to share.